In Yandex.Mail, the spam filter takes care of most random junk emails. What about the messages that are not spam, though, because they go only to you and a few other recipients maybe; the messages from which you cannot unsubscribe because they do not come from or are sent through a list; the messages whose senders will maybe read but not honor your pleas for them to stop? In Yandex.Mail, the blacklist takes care of these messages: you can add an email's sender to that list of blocked senders swiftly, and you can also block any email address manually with ease. Click the All settings gear (⚙) in your Yandex.Mail inbox. Select Message filtering from the menu that has appeared. Enter the email address you want to block under Blacklist. Note that you can only block individual email addresses in Yandex.Mail, not entire domains. Open an email from the address you want to block in Yandex.Mail. Click the sender's email address or name. Click Add to blacklist (⍉) in the sheet that comes up. 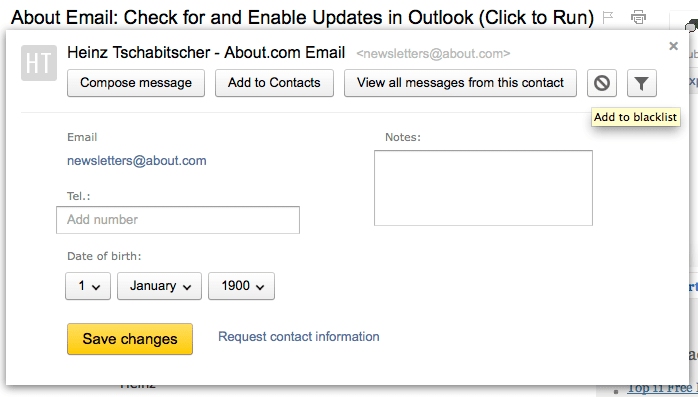 Note that the sender sheet may not be available for certain messages. Click the All settings gear icon (⚙) in your Yandex.Mail's top navigation bar. Select Message filtering from the options that have appeared. Make sure the address you want to unblock is checked under Blacklist. You can check and unblock multiple addresses in one go, of course.